You can be reasonably sure, then, that if I don’t care much for football, then football players aren’t high on the list of things (or people) I care about either. I’m most certainly not interested, therefore, in who they’re sleeping with either (allegedly or otherwise), and whether or not they’ve spent oodles of cash obtaining a super injunction to keep that fact quiet. I do care about – in the sense that I watch and enjoy – science fiction TV shows. I get to know the characters in those shows, I learn to understand how they react to different things, and I enjoy seeing them find themselves in various situations and devise ways out of them. I invest my time in these shows. An example of a science fiction TV show I like is the most recent show, and almost certainly the last one (until at some point in the future someone decides the time is right for a reboot) in the Stargate franchise: Stargate Universe. It got off to a shaky start, but I think they’ve developed some of the key characters really well, come up with some useful plot devices and story lines, and the second season has shaped up to be something pretty good. Yes, I definitely like Stargate Universe. An example of a footballer I don’t have any interest in is Ryan Giggs. He plays the game, apparently quite well according to some, but it’s a game I have no interest in – so as a player of that game, I have no interest in him either. Followers of the game, or perhaps of the team for which he plays, might very well be interested in the man – and that’s fair enough. After all, he might do other things that fans of the game (or team) might be interested in seeing or hearing about: make guest appearances on TV shows, at events, or perhaps write a book. (Similarly, some – many? – fans of science fiction shows might take that level of interest in the actors, etc). That banner persisted for what seemed ages (I subsequently timed it – about 35 seconds), and was quite distracting from the programme itself and therefore very annoying – as much from the fact that it’s not something I’m interested in anyway, through to it just being there, all bright and standing out against the much darker picture of the show I wanted to watch, in my face and crying out “Look at me! Look at me!” in an irritating way. So much so that I had to rewind and watch that part of the show again not once, but twice before I was successfully able to mentally block out the banner and concentrate on the dialogue. That’s bad enough – but not to satisfy Sky. They repeated it for 15 seconds just after the return from every ad break, just as large, and just as bright and irritatingly distracting. 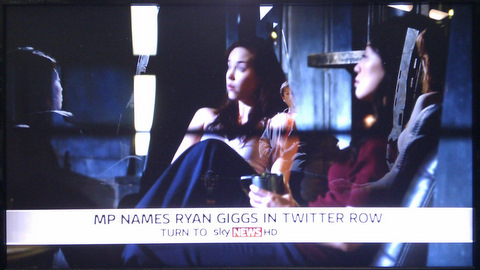 What makes this particularly annoying is that Ryan Giggs being named wasn’t especially big news anyway. There can’t have been many people who were unaware that he is the ‘unnamed’ footballer behind the super injunction that has been the focus of so much attention of late – I certainly was, and I’m someone who doesn’t even give a hoot about football and its players. Of course, reading the banner, it’s not that Ryan Giggs is the player in question that they are reporting on, it’s the fact that he was named by an MP – but let’s be totally honest, here: That was just an excuse for Sky to plaster his name across the screen for as many people as possible to see, because up until then the super injunction meant they couldn’t. That’s childish behaviour, and definitely not a good enough reason to spoil my viewing entertainment – which, let’s not forget, I am paying for (albeit indirectly as a Virgin Media customer and not a Sky customer). I could understand it more if it was big news – no, that’s the wrong term. Not big news: Important news. Something significant that is not only likely to be of interest to me and other science fiction fans, but might affect us in some way. Something that can’t wait until we find out about it later, somewhere else – something that we really need to pay attention to here and now. Celebrity gossip does not fall into that category. It’s not even close. 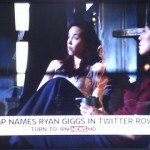 Sky One shows contempt for their viewers. Again.